Terry developed his special colours in watercolour in 2001. He wanted Artists quality watercolour in natural colours which are tricky to mix. 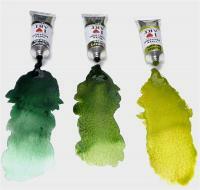 Quality is important, so the paint needed to be lightfast and high in pigment. His range is a all of these things and is also made here in England.